13th September 2007. In this issue: Launch of Places System including Weather & Climate, Rating & Comments, Using the Mapping System, Tech Talk and New & Featured Products. Also, show your support with ExplorOz Racer Polo shirts. Prospecting for Gold has now gone out of print, but with a little effort in recent weeks Michael has sourced 2 new titles that are sure to steer you on the right path. For more information on how you can get into the fascinating pastime of gold prospecting, see our article Prospecting for Gold. ExplorOz is entering a new era of publishing and we are thrilled to finally release some new site developments utilising AJAX and JSON technologies. Our goal is to give you more access to information, make it easier to delve into the depths of our content rich databases, and if you are the contributing type, you can even engage in being a travel writer yourself! For starters, we think you’re going to love the fab new features that have just popped up in Places. The emphasis is on user-controls, more interaction opportunities, and a better visual experience. As a subscriber to the ExplorOz newsletter, we expect you are the kind of person that loves the great outdoors, and generally happy to use the interactive facilities on our site. 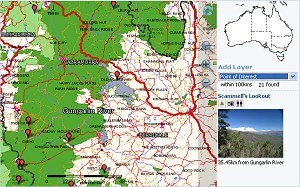 Have you got photos of places you’ve been on disk/on your computer? Have you got coordinates for places you’ve been? Do you have opinions about specific places you’ve been?